Well, here we are the 1st of a new month! 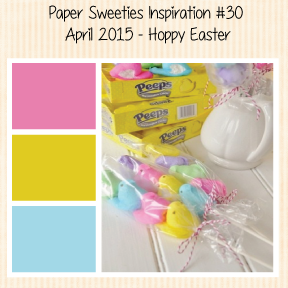 There is a cute new challenge at Paper Sweeties, and we are hoping you will join in the fun using the inspiration challenge photo at the bottom of this post for inspiration. Here is the card I created using the fun inspiration! Here is the Inspiration for this month! Please be sure to stop by the other Sweeties' blog to leave them some love and find further inspiration. Gorgeous card Tammy! Love how you used the doilies! Have a wonderful Easter! Love love love this!!! Loving the egg and the chick!!! Love your card,sooooooooooo cute!! !You and your family a Blessed Easter!!! Your chick is so stinkin'cute!Fab take on the colors too! So full of spring, gorgeous!! This is so super cute, love those doilies you used! Such fun inspiration colors and that little chick is just the cutest! Have a great day! This is SO very pretty, Tammy! Wonderful way to use this month's colors!! Hope you have a wonderful Easter! Love the pink doilies and everything else about this fun card!! Oh so sweet, Tammy -- bright, cheery and fun!! Love the embellies and patterns - looks like a yummy spring quilt! The pink doilies and that little yellow chick are perfect on this cute Easter card!! Love it Tammy. Hope you and Ian are doing well! Love the softness of this card. Very cute! Darling card, Tammy! Love the little pom-poms! So sweet Tammy! Love all your trimmings! Awww, such a sweet, vintage, homespun feel to this, Tammy!